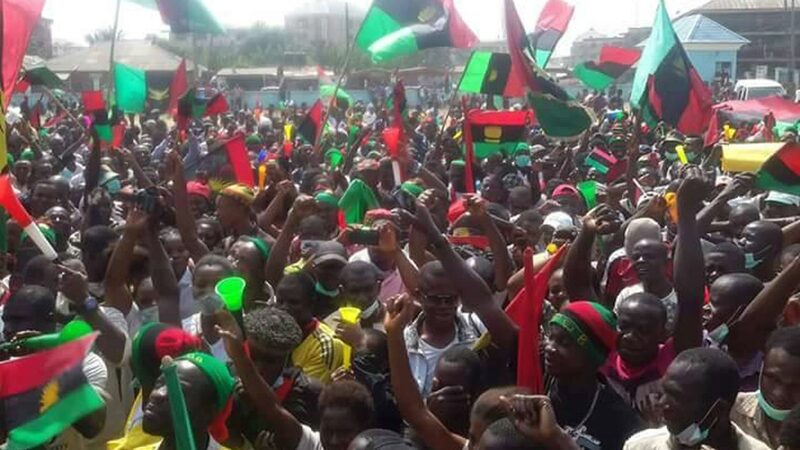 The current agitation championed by the Indigenous People of Biafra (IPOB) to go back to their nationality and restore the Republic of Biafra has caused a lot of panic to Nigeria elites, especially in the presidency. The move occasioned by IPOB leader, Mazi Nnamdi Kanu, to liberate his people from the chain of forced 'one-Nigeria' resulted in his arrest. The Activist was arrested on the 14th of October, 2015 in Lagos, Nigeria, on his way from London to his home town of Umuahia, Biafraland. He was detained in prison alongside three other co-accused for almost two years before he, Kanu, was granted bail on health issues with stringent conditions while the co-accused are still in prison. To keep the tempo cool and peaceful, the activist has requested for a referendum which is the most democratic way to separate any country whose unity is more harmful to its citizens than being apart. Thus, the request for a referendum seems to have caused a lot of pandemonium to those who never understand the present state of Nigeria. Some tagged the request as a call for war. And to APC northern government, it is a no-go-area because they feel that to rule and control Biafra's resources is their birthright which with a referendum, the power given to them by the colonial Master will be given back to the owners, the Biafrans. These fears amongst Nigeria's elites that benefit from the government have possibly led to the campaign of restructuring to avert Biafra referendum. Among the advocates of restructuring is the former Nigerian Head of State, Ibrahim Babangida, who in his 2017 Sallah message, advocated for the restructuring of the Nigerian state and the introduction of state police. This call reinvigorated his earlier statement for structural adjustments that would help the country move on. Also, the former Vice President of Nigeria, Atiku Abubakar, president of Ohanaeze Ndigbo, Nnia John Nwaodo, all opined that restructuring of Nigeria would solve the problem of marginalization and also accommodate the grievances of those agitating for secession from Nigeria. Unfortunately, these ideas and suggestions were struck out on Wednesday 26th of July 2017 by the senate, supported by the House of Assembly and the dual rejected any form of restructuring or bill proposed to amend the 1999 Constitution to devolve more powers to states. This is to show that APC government officials, mainly northerners, are not in support of the restructuring rather continue in line with APC agenda. In the same confusion, some people still went ahead to clamour for the implementation of the 2014 National conference report, to which they claimed could bring the lasting solution to Nigeria's present condition. The call, however, was also rejected by the northerners, stating that the composition of the report was lopsided in favour of the southerners and didn’t represent the interest of the north. Thus, all these rejections were fashioned towards maintaining the status quo of one-Nigeria by northern / APC agenda at the expense of the lives and future of innocent Biafrans and other poor Nigerians, dying every day out of frustration and hunger. Despite the claim of one Nigerianists, separation is rapidly overshadowing the one-Nigerian mantra because of the way Nigeria is being governed by the presidency. It is clear to all that Nigeria is for the north and governed by the northern directives. So for presidency/the north to think that Nigeria will remain one, no matter who is on the floor is a joke of the century. It is now about time to tell the world that Nigeria is not a country but a former Royal Niger Company, owned by British company operated in Niger River Protectorate, later changed to be southern protectorate during the colonial era. The company was later bought over by the British government after the Berlin conference and was headed by Fredrick Lugard whose girlfriend renamed the company to Nigeria after the amalgamation of the northern and southern protectorate. The regions were amalgamated by the British government after taking over the economic activities of the people without any consultation with the people of the regions, to know if they were willing to be one. And ever since the inception of Nigeria, she has remained a nightmare to Biafrans. The regions that are benefiting from one Nigeria, see it as a taboo for Biafrans to agitate for self –determination to secede from Nigeria. And this is what APC government thinks of the Indigenous People of Biafra (IPOB) and their Leader Nnamdi Kanu. It is claiming that those agitating for self –determination to create the Republic of Biafra were not born during the Nigerian/Biafran war and that the group is only some few individuals seeking for recognition, which if a referendum is allowed, are bound to fail. Pointing out that majority of Igbo Biafrans, and other clans of Biafra land as claimed by the Leader of IPOB, are not in support of his quest to secede from Nigeria. Therefore, the Nigerian federal government and its elites are hereby challenged to test the seriousness of Biafrans to restore Biafra. They should test how political leaders have given good governance to the populace, through organising a referendum to convince the world that Nigeria is one united country. If the Nigerian federal government still claims that Nigeria is best as one country especially for her diversity in cultures, let them conduct a referendum to prove to the world that Nigeria is not a failed state. However, a referendum remains the only way Biafra agitators can retreat if they fail to secure a Yes to Biafraexit, hence they will continue their pursuit in the future because the acronym, Biafra, as said by some Biafrans, means: “Blackman’s Ideology About Freedom Femains attainable”, which means that Biafra can never die, but if paused shall continue till it is restored. Thus, the Nigerian federal government is now advised to stop beating about the bush, and call the supreme leader of the Indigenous People of Biafra, Mazi Nnamdi Kanu for a talk on the date for Biafra Referendum, and this must be done as a matter of urgency, to avert more harms to innocent Biafrans and poor Nigerians. Hence the statement that Nigerian’s unity is not negotiable should be disposed of because such ideology can never solve any problem in a democratic government. The unity of the United Kingdom which created Nigeria is negotiable and that's why they engaged in a referendum for Scotland. It is then highly laughable to say that Nigeria which is their creation is not negotiable. Now, Biafra restoration is imminent and any attempt to stop the quest can only result in an unexpected event, because “a child who refuses his mother to sleep will also keep awake with the mother”.